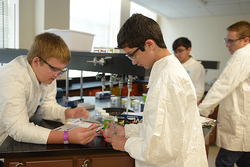 The Stephen F. Austin State University STEM Research and Learning Center will host iMAS Academy for a limited number of students entering sixth through eighth grade June 25-29. NACOGDOCHES, Texas - The Stephen F. Austin State University STEM Research and Learning Center is accepting registration for a weeklong STEM camp for students entering sixth through eighth grade. During Investigations in Math and Science Academy, or iMAS Academy, students spend the week participating in engaging, hands-on activities designed to help them develop a variety of skills while highlighting the diverse careers available in STEM disciplines. "iMAS targets middle school students as they're starting to think about different careers," said Chaurcley Cook, STEM Research and Learning Center summer faculty. "It stimulates their interest in a field that has job opportunities and gives them career choices to consider." Rotating through five different modules led by faculty members and area master teachers, students will design roller coasters, work to solve a crime in a simulated forensic laboratory, design a robot to escape from robot Alcatraz, spend a day nursing patients at a simulated hospital, and use math and chemistry to create a color palette. "They're not just seeing one STEM area," Cook said. "During iMAS, students are exposed to integrated mathematics and science and will participate in different modules throughout the week. It's really impactful to have these opportunities before entering high school." iMAS will be held from 8 a.m. to noon June 25-29 on the SFA campus, Math Building, Room 101. The cost is $100 per attendee and includes materials, snacks, prizes and a T-shirt. Space is limited to 100 spots, so register today by visiting bit.ly/iMAS2018 or calling (936) 468-5814.